Honeybush is well known in the Cape, not so much as a garden shrub, but as a herbal tea. Cyclopia genistoides is a small, typical fynbos shrub, easy to miss when not in flower. A much-branched woody shrub with golden yellow stems, it grows to about one metre. The short needle-like leaves are arranged in threes along the branches, a typical feature of Cyclopia. 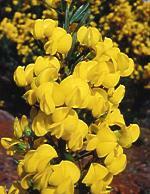 When flowering in spring the same shrub can take your breath away with a bold display of bright yellow flowers. The brown seeds are formed in small pods that turn brown. The pods dry and split open within a few weeks as the seed ripens. Plants from the genus Cyclopia are easily recognized by their sweetly, scented yellow, pea flowers. 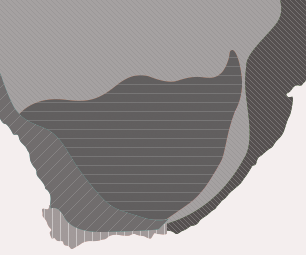 All 23 species of Cyclopia occur only in fynbos; from the Cederberg Mountains, southwards to the Cape Peninsula and eastwards to Port Elizabeth. Usually species are restricted to very small areas and then also to very specific habitats like high mountain peaks, marshy areas, shale bands and wet southern slopes. Caprenter bees are attracted to the sweet smelling flowers at the tip of the branches. They are responsible for most of the pollination. After fire old honeybush plants shoot out vigorously from the surviving roots,which act as a storage organ. The tea, made from the shoots of the shrub, contains no caffeine and also has a much lower tannin content than the oriental teas. 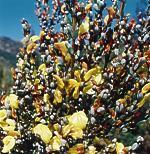 Traditionally, honeybush tea was made from Cyclopia genistoides, which occurs naturally on mountains near the Cape Peninsula. Today, honeybush tea has become so popular that fields of Cyclopia genistoides for commercial harvesting have been successfully established on sandy soils in the southern Cape. To make the tea the stems and leaves are chopped into small pieces, wet and then left in heaps where they ferment spontaneously, They may be heated in an oven to about 60°C - 70°C to enhance the process. After sufficient fermentation, the tea is spread out in the sun to dry. After sifting, it is ready for use. Honeybush tea, with its own distinct sweet taste and aroma, is made like ordinary tea, except that simmering enhances the flavour. Drinking honeybush tea is said to promote good health, stimulate the appetite, and the milk flow of lactating mothers. Honeybush tea was traditionally harvested only for home use, but has recently developed into an exciting, new commercial product as the demand has increased from tea-lovers around the world. Other species such as Cyclopia intermedia (bergtee) and Cyclopia subternata (vleitee) and Cyclopia sessiliflora (Heidelbergtee) are also harvested for tea. At present about 125 ton of honeybush tea is produced annually. This is collected from plants in the wild and an increasing amount from cultivated plantations. Cyclopia genistoides can be propagated by seed or cuttings. The best time to sow seed is from summer to autumn. To select viable seeds throw the seed into a jug of water and remove any seeds that float to the surface. Before sowing the seeds need to be treated. First, the hard seed coat which protects the small seeds, needs to be damage to enable the uptake of moisture for germination. In nature this hard seed coat would slowly be damaged in the soil by micro-organisms and other factors. In the nursery the scarifying of the dry seed can be done with sulfuric acid. Proceed with caution to avoid the chemical coming into contact with one's skin.. If only a small amount of seed is needed, an easier way to damage the seed coat is to lightly sand the seeds with sandpaper. The seeds of cyclopias and many other fynbos plants are adapted to germinate after fire. Experiments have shown that it is the smoke of the fire which stimulates the germination of the seed. To get this same effect the seed can be treated with smoke extract, which is produced and sold at Kirstenbosch.The seed must be sown on a medium with good drainage and a low pH of 3.5 to 5. Germination usually takes place within two weeks. To prevent damping off, a fungicide should be used. The young seedlings are potted up as soon as they are big enough to handle and grown on in the nursery before planting out. Many plants of the legume family, which include cyclopias, are often difficult to root from cuttings, but Cyclopia genistoides is an exception. Tip cuttings can be made using Seradix 2 as a rooting hormone. Honeybush needs to be planted in full sun and well-drained soil. The plants are sensitive to severe frost. The plants grow fairly fast but start to look untidy after a few years if not regularly pruned or burned, which is what usually happens in nature.